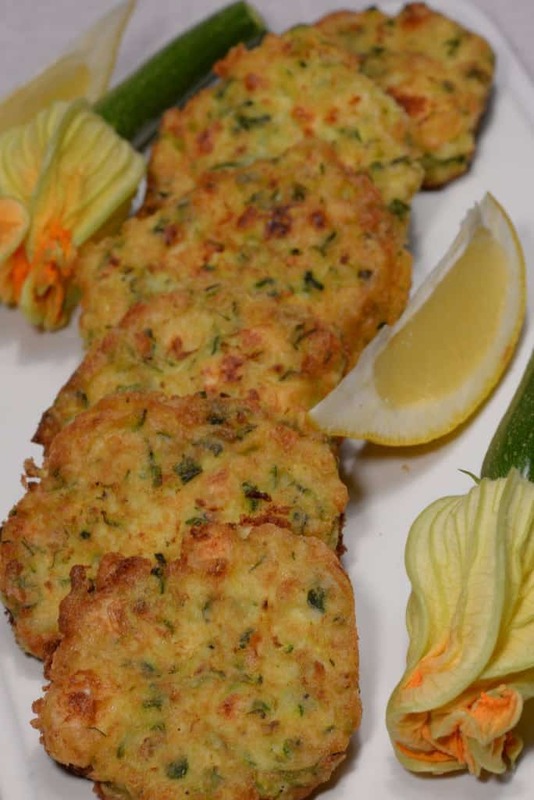 Greek kolokithokeftedes (Zucchini Fritters )are wonderful little treats. They are perfect as an appetizer or part of your Greek mezedes. They are made with a little feta, dill and garlic. They are best served warm right after frying. Serve with a lemon wedge and enjoy! A wonderful way to use an abundance of garden zucchini! They are also excellent dipped in Greek Tzatziki. Shred the zucchini on the large holes of a grater. Transfer the zucchini to a fine mesh strainer and set over a bowl. Toss the zucchini with the salt and let it sit for 10 minutes. Wring all of the excess liquid out of the zucchini with your hands, then set aside. Beat the eggs in a large bowl. Mix in the dried zucchini, scallions, dill, feta, garlic and black pepper. Sprinkle the corn starch and baking powder over mixture and stir until mixed thoroughly. Heat 3 tablespoons olive oil in a large non-stick skillet over medium heat. Drop 2-tablespoon sized portions into the pan, then use the back of a spoon to gently press the batter into 2-inch-wide fritters. Pan-fry until golden brown on both sides, 2-3 minutes per side. Transfer the fritters to a paper towel-lined plate. Wipe the skillet clean with paper towels. Return the skillet to medium heat, add the remaining 3 tablespoons olive oil, and repeat with remaining batter. Serve warm or room temperature with lemon wedges.